Build a New Porch, Get the True Cost! If you know anything about Simply Additions, then you know that we answer email requests for home addition design ideas. Last spring Todd and Wendy contacted us because they wanted to build a country porch in front of their traditionally styled colonial. Todd and Wendy didn't send us any pictures of their existing house, but they did describe it well enough so that we could come up with a front porch design that would be appealing to them and hopefully to you. Look at the before picture to see what a pleasant difference this front porch addition made to the appearance of this house. Curb appeal seems to be a hot topic now a days and by building this country porch you can have an extraordinary curb appeal makeover. 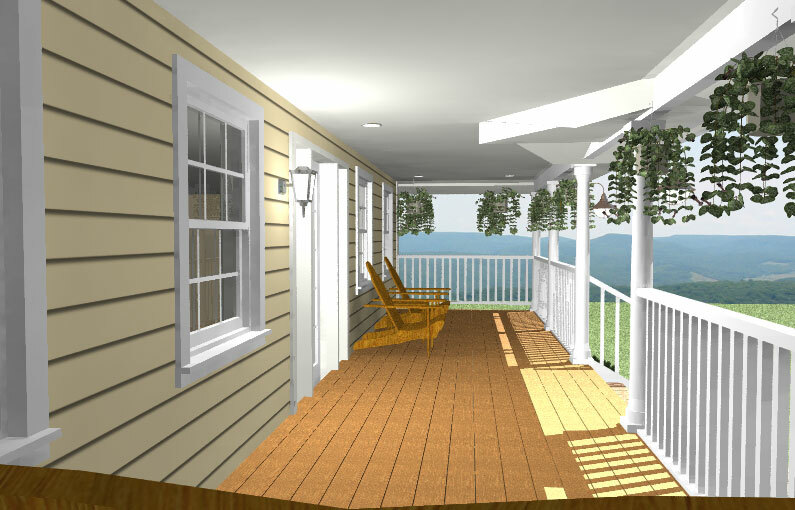 The front porch addition was designed with 6 columns, white railings,composite decking, composite stair treads, and striking lattice work which covers up the area underneath the porch deck. This porch was estimated to be built on concrete piers, which are best covered up by the white lattice work shown above. Use our automated contractor locating service like Todd and Wendy did, to find the perfect local contractor to customize and build your porch. Simply fill out the form below to get started. Use our automated contractor locating service to find the perfect contractor who is known to build some of the nicest porch additions in your area. Simply fill out the form below to get started.